Creates cross section views of drawing views that were generated by the ViewBase command in a paper space layout. Note: This command operates only in paper space. As you move the cursor, the program draws the section view dynamically, parallel to the section line. Specifies the one end of the section line; pick a point in the layout. The command repeats so that you can draw sections lines with jogs. Specify next point of section line [Done] <Done> - pick the point that defines the view direction, such as #3. 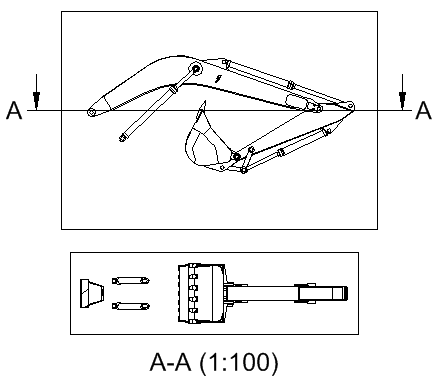 The position of this third point determines whether the part of the model that is not cut displays (left) or not (right). 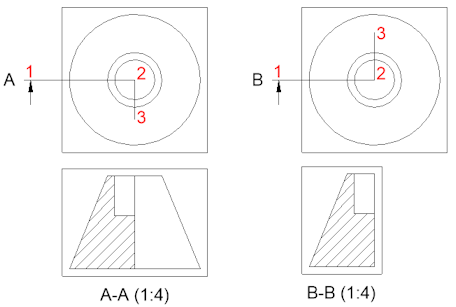 Offset - section line defines a series of cutting regions located on different offsets from each other; enter Done to complete the section line. Aligned - section line defines a polyline, where every segment defines a cutting region. The resulted section will have the length equal to the sum of the lengths of cutting regions; enter Done to complete the section line. Tap the Ctrl key to turn off alignment so that you can place the section view anywhere on the sheet. When the BM_Ortho_Hidden and BM_Isometric_Hidden layers are off or frozen, hidden lines will not display. The AUTOVPFITTING variable controls whether the size of the viewport is adjusted automatically to fit the current extents of the 3D geometry. By default AUTOVPFITTING = ON. Normal - draws the section as a union of projections of every cutting region (each segment of the section polyline) in its normal direction. 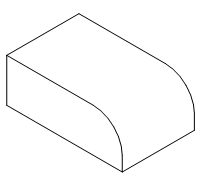 Orthogonal - draws the section in the normal direction of the first section region (first segment of the section polyline). 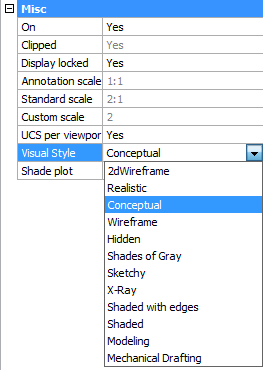 The GENERATEASSOCVIEWS system variable controls whether VIEWSECTION produces 2D views which are persistently associated with the source 3D model. If GENERATEASSOCIVIEWS is ON, associative dimensions are updated automatically when the 3D model is modified. 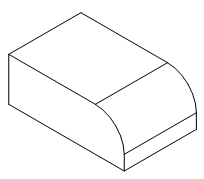 If the Sectionable property of a mechanical component is OFF, the component appears non-sectioned in the section views of the Full section type. Section lines can be edited through grips. Select either the section line, one of the identifiers or an arrow. 1. Controls the position of the first identifier. 2. Defines the start point of the section line. 3. Allows to move the section line. 4. Defines the endpoint of the section line. 5. Controls the position of the second identifier. MvSetup - Creates multiple paper space viewports; aligns, rotates and scales paper space viewports. In model space, the command creates a rectangle, representing a paper sheet with respect to a specified scale. ViewExport - exports the content of drawing views and sections obtained by VIEWBASE and VIEWSECTION to the Model Space of the drawing. ViewExport - Exports the content of drawing views obtained by VIEWBASE and VIEWSECTION to the Model Space of the drawing or to a new drawing.